Man, sounds like you've got a full plate for a while Dean! I don't envy you there. Fixing a crack will be like a pleasant vacation after dealing with sorting and moving! Just be sure and use one of those high silicon caulks, that'll handle all that expansion and contraction! Hell maybe that's what I should use to close my boxes, it'd have enough give to it the plates maybe wouldn't crack! Well Dean has gotten settled and is back in the shop, hurrah! He sent me some pics of his build and permission to post them, so here we go. This is getting an oil/varnish finish on it and it's looking good! Love that top! My photobucket account just wouldn't cooperate with rotating this image. Hey Dean, what happened to the cracks? I can't even see the bondo. No wimpy bandsawing for Dean! Getting close Dean, have you strung it up yet? Thanks for posting the pics, I was having trouble with my site. I glued cleats along the back cracks, rubbed in glue and worked up a little 120 sanding dust to fill them. It went pretty well and I hope the diamond cleats hold them together this winter. I'll send a humidifier along. 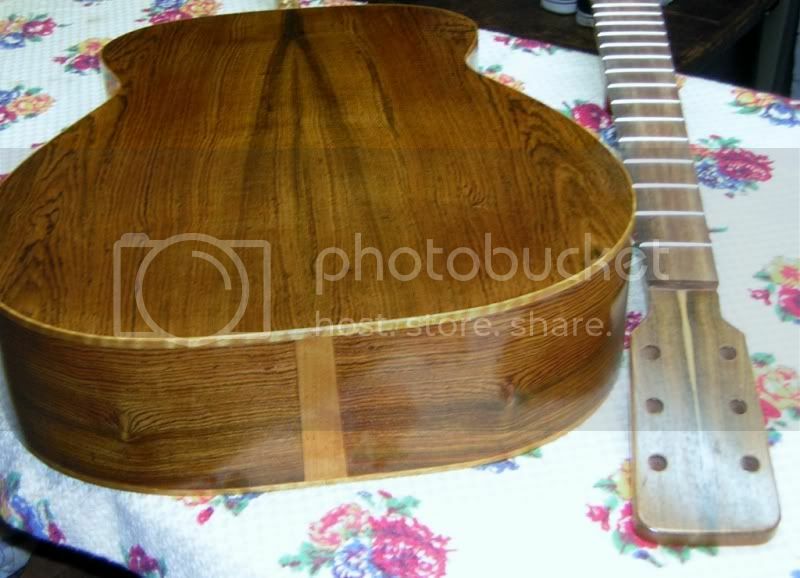 I am fitting the nut right now, shaping the saddle and hope to hear this guitar vibrate by night's end. I'll send more pics later tonight or first thing in the morning. I got Joe's guitar strung up tonight and it sounds great. I sent some pics to Joe and he may post, but I am pleased with the results and I think Joe will be too. A little setup and finish tweaking- then off to Joe, probably by July 1. This was a cool endeavor. Its bee yoo tee full, D! and you're goin' to the Gathering? Damn, i gotta get there! Eben, that was a nice post for your 4,444th post. Ever encouraging, friendly, and warm. Dean, its great to hear that you like the sound. 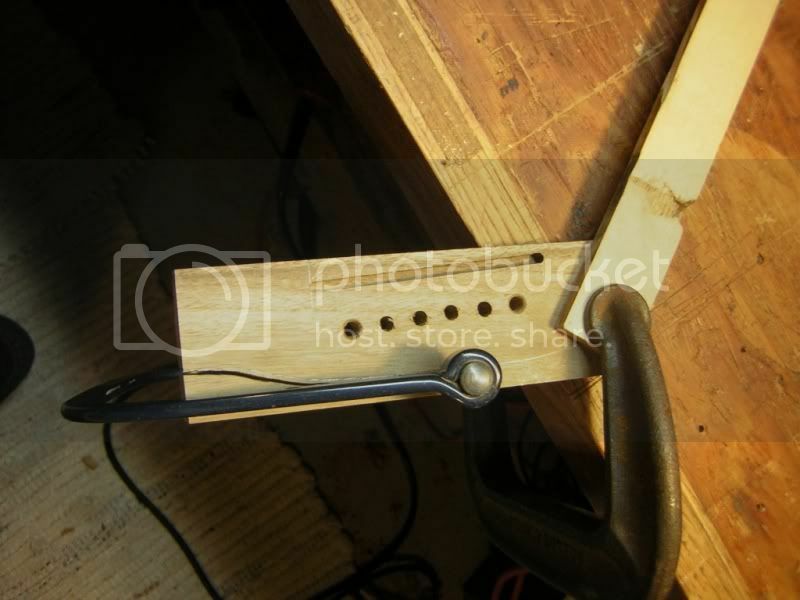 I always thought Bocote was kind of a 'dead' sounding wood, and then I played the one Grant made - and changed my mind. Nice combination of wood species. It really looks great! And yeah, great to hear you're going to make it to Stringfest! And here's the builder enjoying a good life, doesn't get any better than this! And here's the finished guitar, nice soft glow to the finish. Although I do think you might need to soften the corners on that nut just a bit. Can't wait to pluck those strings Dean! Seeing the top on this one makes me want to use one of mine. I really like the color of spruce from that bridge stringer. I put one of these tops on a mango dread I did several years ago - liked the look and the sound was great. Sold it to a rancher out in Levelland, Texas. I think I remember that you too have a mango set from that same board Eben and I shared ? Good to see you back in the shop building. Remember it's the process of building you must love. I rubbed the top down to 600 cause I mucked up the top some during the bridge attachment and put a thin coat of oil varnish on two weeks ago, let dry, sanded lightly with 3200 micro and followed with another coat today. I plan to let this dry and check it out, another week or so, and then get it down to Joe. My idea throughout this project was understated, restraint, complementary and I have achieved that. 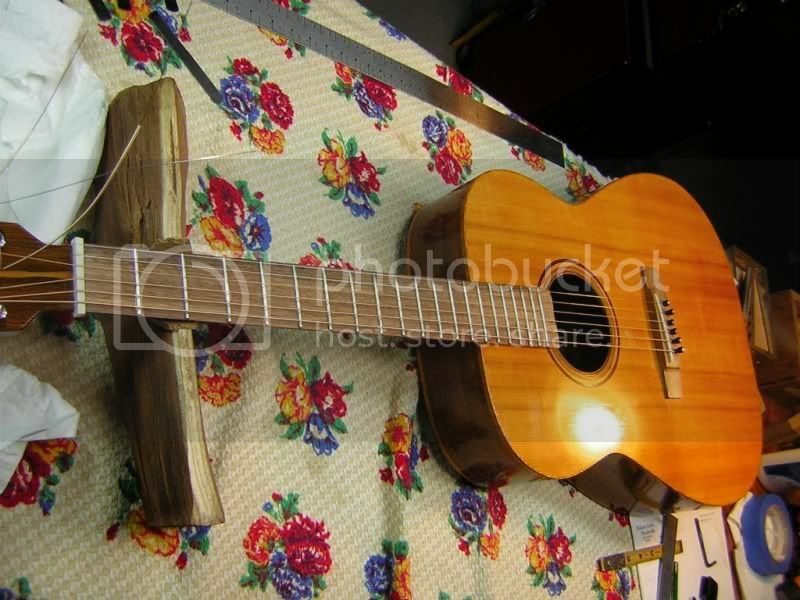 The colors and wood speaks for itself- pluck a string and you hear there's more to say. I know Joe will appreciate this addition to his arsenal. Final pics soon, or I may leave that for Joe. Just wanted to let everyone know I picked up Dean's guitar at the post office yesterday evening so our build swap has been successfully completed! First impression is that it's very vibrant and loud, with complex overtones, and responds well to bare fingered picking, no finger picks required. My camera is broken so no new pics, maybe Dean took some final shots before shipping? Anyway I'll be getting to know her and see if I can learn to make use of that extra neck length, all my guitars are 12 fretters. 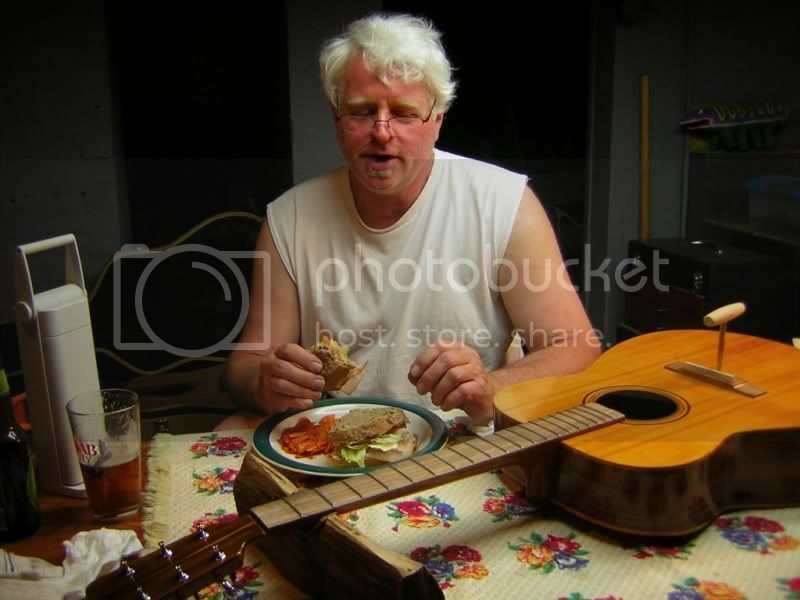 I am relieved your guitar arrived safely Joe- good deal. 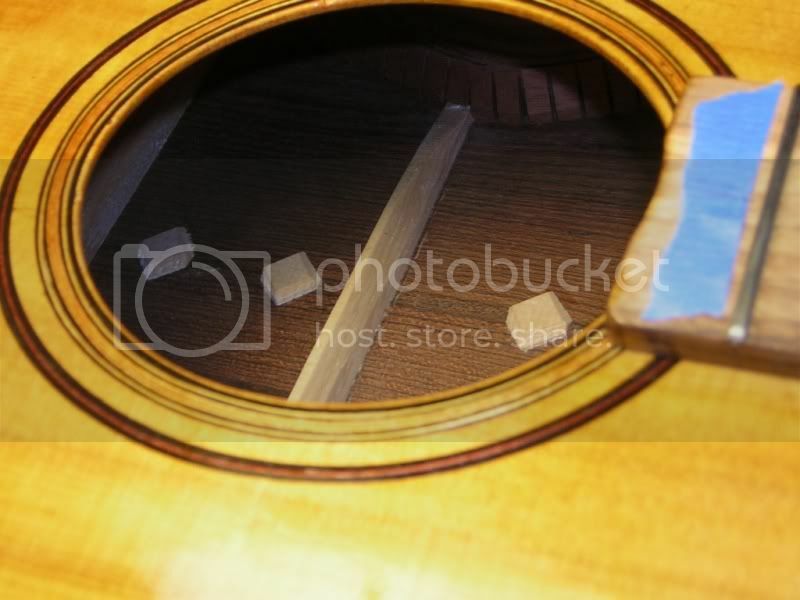 Looking back at the building posts, I am taken back at all the changes my life has taken while working on your guitar. I moved out of my farm house and shop in a very rural area of Wisconsin, divorced, moved into an apartment in town closer to my job at a college where I work as a Grounds manager, connected to many musicians and friends in the area here, met a beautiful wonderful woman and feel in love, we married, we bought a house together and I set up shop in the basement, and your guitar has been the only constant through all of it. Like a tear in the recipe or a drop of blood, it all affects the outcome. 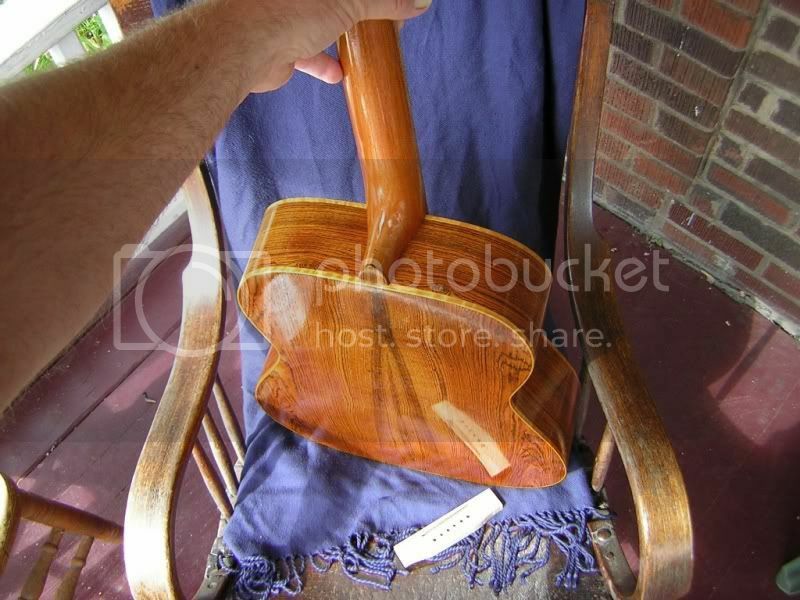 It was too hot for shipping to Joe this Summer, so I played this baby for a few months, and when the weather cooled I realized the action was too high for my comfort (especially after playing the guitar Joe made for me), so I did some final nut adjustments, and then touched up the neck angle with a few strokes of a sanding block because I didn't want to lower the saddle height, and everything fell into place. I was satisfied and felt it was time to ship to Joe. Joe's guitar is the easiest player I have built. The volume is to my liking too. I learned more about set-up on this one and I think I got a little lucky in that area. I also had a chance to experiment with oil varnish! I hope you enjoy this guitar Joe- like I enjoy the guitar you built for me. Please post a picture of you playing it in that beautiful shop of yours, surrounded by plants and tools and your stove, with abundant daylight and artwork- like I pictured it from the beginning. Thanks Joe for being so patient and trusting my judgement. We are all really happy for you and your new life. Hope Joe can find a way to post some pictures. How is the guitar holding up? I just finished another with the same bracing pattern and I really am enjoying it and it got me to wondering about yours. Yeah! Ditto on the axe and a general Joe status check even more so! Hey Dean and Eben, good to hear from you. 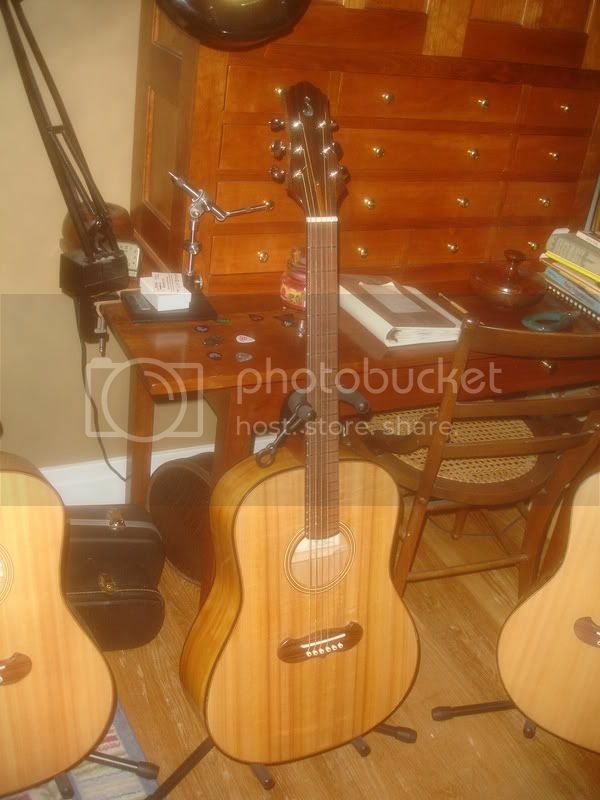 Just pulled the guitar off the stand and wiped a good healthy coat of dust off it. Obviously I haven't been playing much. Tuned her up, play a bit and am hearing a vibratory rattle, very strong on some notes, sounds like it's in the neck. Take her over to the shop, loosen the strings, tweak the truss rod a bit, retune, and problem solved. Need to adjust the action some, it's risen to 5/32" on bass, 4/32" on treble at 12th fret. A bit too high for easy playing up the neck. Looking her over, don't see any problem, just a slight belly. Time for a little neck joint flossing. Still sounds good though! On the Joe side the story's not so sweet. Had to put Patty in a nursing home. She was to the point where she was wanting to go home all the time, not recognizing that she was in her home. Found a really good, caring home, an independent not a chain. Felt good about that. Unfortunately after 3 weeks her anxiety and aggression increased to where we had to put her in a hospital psych unit to try and get her on some meds to mellow her out. Two weeks in there, back to the nursing home. They felt she was worse than when she left and was so overmedicated she couldn't walk. So now she's in the geri unit of a private psych hospital to try and get her meds straightened out. Been 4 weeks now, I get to visit on Saturdays. Her anxiety level seems better and she's walking again but still being difficult about changing etc. Just doesn't understand what they're trying to do. Hopefully they can get her leveled out where she can go back to the nursing home. Needless to say Patty isn't the only one having a rough time. Watching your soulmate lose her mind after 42 years of bliss, and not being able to help her is beyond rough. My heart sank when I read your post. I have no frame of reference, so I cannot tell you I understand what you are going through. I can only tell you that my thoughts are with you my friend. Thanks David, that means a lot! Dean, I forget to answer your finish question. It was rottenstone rubbed in with a piece of felt. I picked it up from one of Colin's builds. As I recall he rubbed it in dry. I tried that but it didn't do much, maybe the finish had cured longer, anyway I spritzed a bit of water on the area I was rubbing and just worked around like that. It gave it a nice mellow sheen. The varnish finish seems to be holding up well. 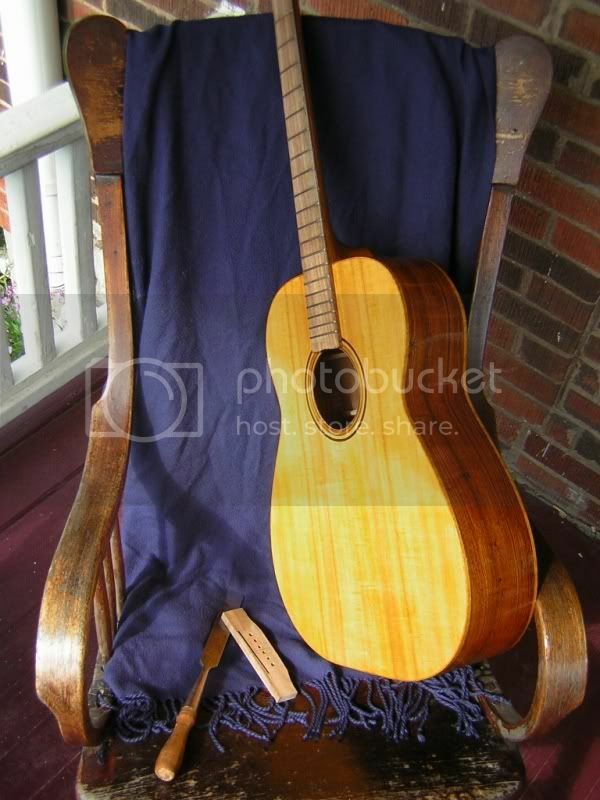 Thanks for the update on the guitar and I am sorry to hear about the turn with Patty. Like David, I have no frame of reference- but my heart goes out to you. Back to the guitar....try a clockwise turn or maybe two. I usually do the set up in a non tension position and I think this might do it. Keep in touch and I think of you often. 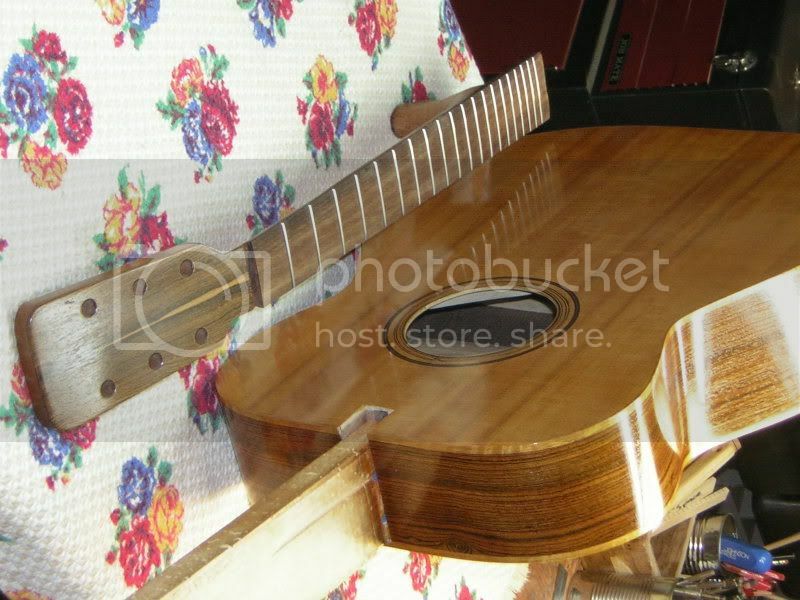 Your guitar hangs in my shop and I play it often. So sorry to hear about Patty. I can only imagine... In our mid (Audrey) to late (me) 70s it is what we both fear. So difficult, but do try to be kind to yourself as well as to Patty. Hey Joe, like others have said, I can only imagine what you are going through. Though we have never personally met, you are as much a friend as someone I have known most of my life. It seems kinda empty saying I wish you the best or something similar, but I think of you often. Keep in touch and let us know what is happening. There is a whole family of folks here who care. Thanks for the thoughts and words guys! It does help, I'm pretty much a hermit here now, (see childhood dreams can come true), learning to talk to myself. Joe, I too am sending my best wishes and thoughts your way. I am not sure if you saw the thread I started... But I just want you to know that bracing pattern worked perfect and contributed to my favorite guitar to date! Thanks again. I hope you liked the cd as well! There's nothing we can say, other than that you are dearly loved and appreciated here; you're a big part of our family too, and I know we're all thinking of you and pulling for Patty. I was thinking about you last week, and thinking about Patty, and wondering how things were going. I hope she is comfortable, and not fearful. I'm so happy that you've had a lifetime of love together, a lifetime of memories, and so happy for Patty that she has had you and your love in her life. I'm always available to talk, if you want - phone or Skype, or I'll stretch a string and connect a tincan at both ends if necessary. Sending my love to you and Patty, Joe. Okay guys, you're choking me up. Yes, this is definitely the toughest thing I've ever been through. It sure helps to have this family here! Real life "friends" and "family" (2 out of 3 kids), have taken a pass. One son, Steve, has been awesome. Moved back home (from Lake Tahoe no less) to help take care of his mama for the last year. A real life-saver! 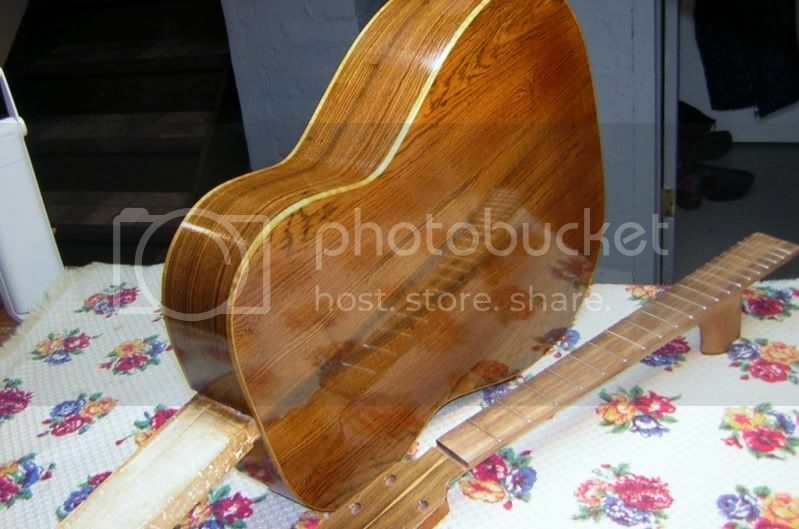 Enough sad stories guys, go build some guitars! I missed your build thread Josh, I'll go look it up now. Glad it worked out for you. And somehow never got the cd. Thanks again everyone, It means a lot! ps... thanks Dennis! I know you're available to talk and do appreciate it. Just not sure I can talk, and long distance crying wouldn't make much of a conversation.